Sins of Variance: Empathy Lost – A Dystopian Future. ROB WILLIAMS has served in multiple roles supporting the Christian community. Included in this long list of mentorship was his service as youth director of an inner city church in Atlanta and working with children in some of the toughest housing projects in that city. Rob worked at a rehabilitation center for five years, where he became acquainted with the homeless. The center helped those on work release from jail and those who were physically and mentally handicapped. Rob has certainly had his share of memorable experiences. Whether surviving a motorcycle crash as a teenager (concussion, burns and broken bones), saving the life of a construction worker hanging by a hand from a third story roof, or rescuing a mentally impaired man from a building fire the man had started himself, Rob has always turned to his faith and God. So he taught adult Sunday school classes for over twenty-five years, and led Boy Scout and Cub Scout groups for twenty. Currently working full-time in the high tech industry, he writes Christian fiction and science fiction in his free time. 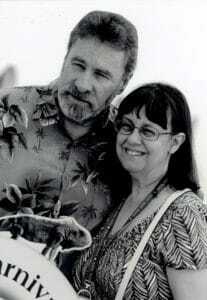 He is the author of the three novel Brandon Springs Christian fictional series. A visit to England, combined with personal experience in the high tech world, inspired him to write the fictional novel Sins of Variance. Rob lives in Huntsville, Alabama with his wife, Gwyn, and is the father of four, with grandchildren in both Florida and Texas. SINS OF VARIANCE takes place 500 years into the future in Gloucestershire County, United Kingdom (near Wales). We attempt to channel human nature through culture, education, and advanced medicine. We wish for science to tame the worst of our nature, and future knowledge may enable us to significantly alter mankind. We should be careful to thoroughly understand the side effects of what we put in motion. Mankind has been modified through genetic engineering, almost to the point of being unrecognizable from what we know today. Advanced genetics has brought about a complete “optimal” set of genomes preferred by the society. Though variation has been bred out of most humans, there are rare individuals with unique inner characteristics who have been deemed unacceptable by the society. They struggle because of these personal differences, and some people are eliminated. The two main characters, father and daughter, find that their world is not really what they have been led to believe. Favoritism has been banned, but the father is unable to hide his paternal love for his little girl. They are two of the select few who encounter more primitive aspects of the planet and are exposed to dangers of the worst kind. Journey with them as they discover what has actually happened to mankind, and encounter terrors they could have never imagined. This novel would be rated on the high side of PG-13 because of violence. The Link to Rob’s author website (www.robwilliamsnovels.com) is HERE. Rob Williams’ Sins of Variance poses one of these science fiction crossroads in a difficult future of dark choices for the human race. Williams’ world is a future where many humans have been genetically tailored to avoid conflict, but in his story he also asks whether such a success, made through genetic neutralization of emotion, is a good thing. With the next century promising the arrival of true artificial intelligence and a mankind that must evolve with our ability to manipulate man and machine, maybe some of the questions the author poses should be addressed today. If they aren’t, quite possibly our species dies in the process as we eat away at hope in a world where only the powerful survive and prosper. Published by The Ardent Writer Press in March 2018. 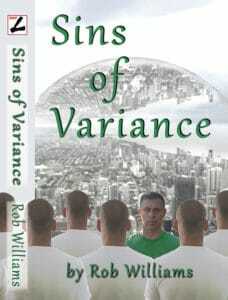 The link to Amazon for the paperback version of Sins of Variance is HERE. The link to Amazon for the eBook version of Sins of Variance is HERE. The link to Amazon for Three Days in Brandon Springs is HERE. The link to Amazon for In Search of Brandon Springs is HERE. The link to Amazon for Rest in Brandon Springs is HERE.